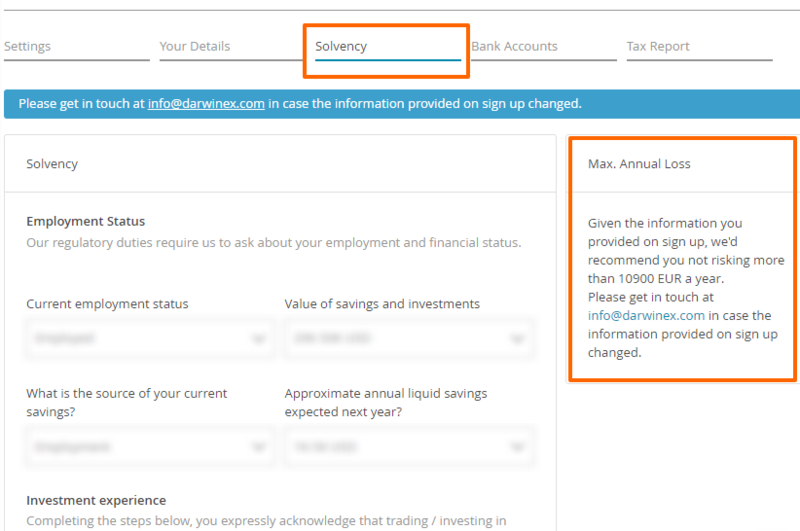 Our recommendation for maximum risk based on the information about knowledge and savings of the user introduced under the 'Solvency' section of the Darwinex profile. That’s why it’s important that the data you introduce reflect your real situation. Should your financial profile change, please inform us so we can update this data and give you a new recommendation based on your new profile. We recommend a maximum risk for practical, moral and regulatory reasons. Investors risking more than they´re psychologically prepared to suffer loss aversion. Loss aversion is a cognitive bias whereby investors sell investments when losing, thus not recovering when those eventually recover. This makes them lose systematically. DARWINs, just like any other investment, carry risk. Morally, we don´t want investors to face losses they can't bear financially. Further, we fully endorse the FCA´s TCF (Treating Customers Fairly) focus on fair outcomes for customers - and our risk management approach is designed to achieve fair & transparent outcomes for consumers.